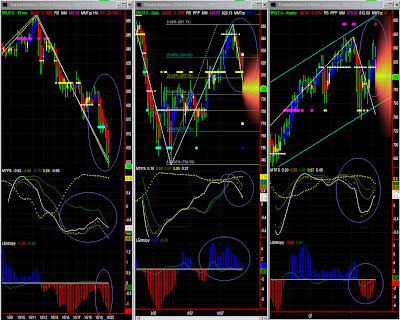 Market direction: congestion to down initially. No panic just yet, as a support will probably be found soon. It is relatively difficult to comment this market correctly as one could be tempted to join the new bear wave and announce the apocalypse. The truth is that this correction was expected and probably also healthy. There is no indication that it will go much lower as the daily chart may find a support soon, hence bounce and stay relatively bullish overall. Support level to be found around 794 or 781. Very negative bias at first. Although we saw it coming, we certainly got a little caught by this draft. Low time frames are still very bearish indicating it will be difficult to gauge whether 150 where SPY closed will hold. MTFS does not give us the indication of a bottom in the short tern, so it is indeed very possible to see a lower open even if 150 holds overall. Profit taking accelerated and we admittedly underestimated the impact of the high volatility environment we've had in the last few months.At this point, 150 should hold, but we'll have to watch lower Fib levels too. MTFS has its green line with a steper gradient indicating the correction could indeed gather momentum. One should however not jump into conclusions: this is still nothing more than a normal correction. 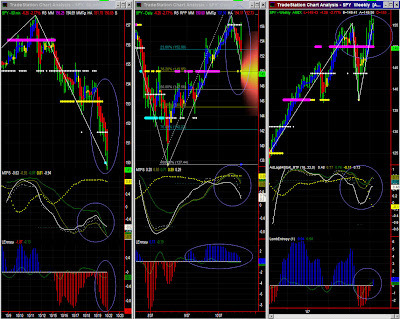 Weekly: Congestion to mildly up, but caution: significance level is ridiculously low. The Swing indicator is up, but the key swing price level is still close at this time frame, so the indicator could turn around again. For the time being, everything still points (at least mildly) upward. We can however see some divergence in AdStoK and a very low significance level at this time frame (divergence? ), so this is at best only a background information at the moment, and one should certainly focus on lower time frames (60mins and daily).